External forces do have agency on a chosen course. It is a push and pull exerted over a lifetime. As architects, the dependence on patrons is clear, that is the well-known realization that architecture is “made to order”. Within this context, the word “compromise” acquires a whole new import in our inner vocabulary. Compromise is negotiation, not yielding. Example of such a stance are “both|and” attitudes rather than “either|or”. These approaches allow greater management of unforeseen change, balancing one’s perception of value while listening to others. The fight between heart and mind, between luck and focus, between money and quality goes on. Balance is the interface between the self and the world. It is a realization that brings perspective, and renewed determination. We seek the best possible outcome from an almost infinite set of conditions. Some of these conditions are inspiring /uplifting, some so woeful and heavy that they threaten to drag down the potential for the project to provide a meaningful environment. Architecture is an art|science|business. The architect, like the artist, has made a personal commitment that can last an entire life trajectory. The architect does manage a dynamic of emotions, many conflicting, all necessary to ascertain his/her feelings toward this most challenging art form. 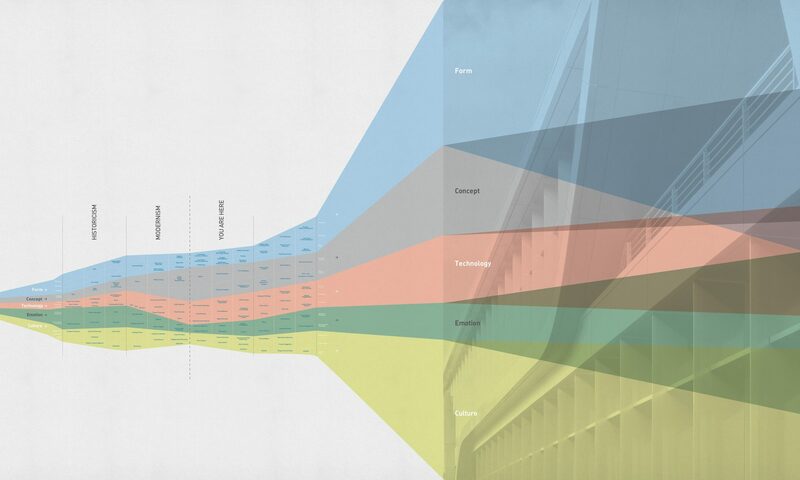 Over time, attitudes have changed about architecture. The gamut of signification is wide and inconsistently flattering. From mother of all arts to pure decoration, architecture has routinely survived adoration and vilification. Holding on to the “both|and” paves the way for a permeable course to grant architecture a seat at the Table of Relevance for humanity. The acknowledgement is that many attitudes inhabit the making of architecture. From the prosaic to the poetic, the occupational mentality versus the heroic defender of high ideals, architects can take on as many identities as their visioning abilities allow them to embrace. Giving is an option in architecture, rather than a dogma. Competence alone already conveys a form of social responsibility. It is an alternative, however, to push architecture to the next level of meaningful impact on the community. Longevity is a factual test of our union to architecture. It comes at a cost, despite its life affirming benefits. External and internal factors will question our being rational about it, practical, matter of fact, sensible, and even meaningful. That is a storm with many casualties, as youthful enthusiasm might give way to disenchantment. With the accrual of experience year after year, the perceived general public [idealized and mythologized in the mind] of one’s alleged grand acts has vanished from our dreams and what is left is the mirage of an unrealized possibility. The alternative acknowledges the regenerative capacity of love for architecture to replenish our passion, an addictive circularity that perpetuates this endless fascination. This balancing act is complex. The path is hard. Everything is trying to pull you off the wire. This resolve, however, counteracts these ongoing forces. Knowledge of the self and of one’s place in the world has much to do with an architect’s work. What to envision, what to strive for, what to advocate, what to defend, can only emerge if rooted in the understanding of our own emotional chart and the ensuing action in physical reality. It is anachronistic to live by universalistic rules in a world of global connectivity. This creative eclecticism is exhilarating, rather than confusing. It is this era that the architect is destined to translate into space.